Ever wonder how you can keep up with your child’s back to school style without breaking the bank? 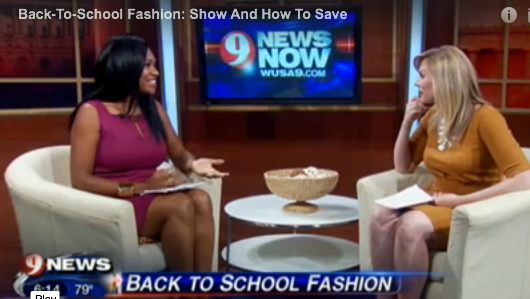 You can watch my debut appearance here on W*USA Channel 9 News where I discuss some of the best looks you’ll definitely see from the runways to the hallways to your kids closet. Here are some tips to help you get the most bang for your buck this Fall! 2. Create an itemized list with both classic and trendy pieces your children are asking you to buy. 3. Skip the shopping mall and head towards bargain department stores like TJ Maxx,Marshall’s, Loehman’s, H&M, Zara and even Target for the designer looks without the price tag. 4. Go to the Gap and Gap Outlet for higher quality clothing for the best possible prices. 5. Host a “Kids Clothing Swap” by inviting your fellow parent friends and their kids over to swap out their gently used clothing. It’s sometimes surprising how badly kids want something their friends have. Now, here’s a chance for them to share what they no longer use!